EA Sports put the Madden cover to a vote once again this year, and as of last week, the fans had whittled down a bracket of 64 NFL players to just two: Carolina Panthers quarterback Cam "Ace Boogie" Newton (the No. 1 seed) and Detroit Lions wide receiver Calvin "Megatron" Johnson (the No. 6 seed). In an episode of ESPN's SportsNation broadcast live from New York City's Times Square yesterday evening, hosts Colin Cowherd and Michelle Beadle revealed that Johnson beat out Newton for the coveted cover spot. The marketing partnership between ESPN and EA Sports, now in its second year, proved even more fruitful this time around. Fans cast over 19.6 million votes, a 54% jump from the 12.7 million tallies for the Madden NFL 12 campaign. The final face-off was a close one: Johnson defeated Newton by a margin of 52% to 48%. Along the way, he took down teammate Matthew Stafford, No. 11 seed Dwayne Bowe, No. 3 seed Arian Foster, No. 2 seed Rob Gronkowski, and No. 1 seed Aaron Rodgers. A clearly disappointed Newton was nonetheless gracious in defeat, giving "big ups to Megatron." 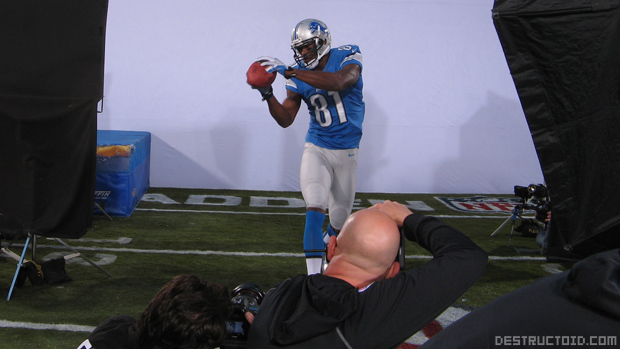 As for Johnson, EA Sports personnel whisked him away after the SportsNation broadcast to don his full Lions uniform and game-day equipment for a photoshoot in Times Square. One of the images taken yesterday will become the final box art for Madden NFL 13, which launches for Xbox 360, PlayStation 3, PlayStation Vita, and Wii on August 28, 2012. Check out the gallery below for 17 photos from the event, captured by yours truly. Are you guys happy to see Megatron on the Madden 13 cover? If not, whom would you have picked?